Environmental education is a concept encompassing a vision of education that seeks to empower people of all ages to assume responsibility for creating a sustainable future, an understanding of, and concern for, stewardship of the natural environment, and the knowledge to contribute to ecologically sustainable development. The term is often used to imply education within the school system, however, it is sometimes used more broadly to include all efforts to educate the public and other audiences, including print materials, websites, media campaigns, etc. 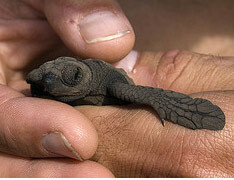 A newly hatched sea turtle from the refuge at Puerto Arista, Mexico. • Development of critical thinking skills and learning how to work collaboratively to improve human and environmental wellbeing. Effective environmental education requires the regular use of learner-centered, interactive teaching and learning strategies, in various education systems. 3. To create new patterns of behavior of individuals, groups and society as a whole towards the environment. Effective environmental education develops learning opportunities outside the classroom through special environmental events, celebrations and projects to complement classroom activities; involving students in investigating, maintaining and improving the local environment; using the community to investigate practical and real-life situations; incorporating outside programs and services into school programs to bring learning to life; utilizing the facilities of environmental education centers. Enhanced awareness, expression of interest and behavioral changes are the initial signs of the successful educational process. It is when positive attitudinal changes occur that one of the most important objectives of education has been achieved. It includes many of the founding principles of environmental education but with a stronger human focus, recognizing that fundamental human rights and social justice are just as essential to sustainable development as environmental sustainability. Humans are an inseparable part of the environment and we are part of a system that connects individuals, their culture and their natural surroundings. The natural world contains a range of renewable and finite resources that humans can develop to satisfy their needs and wants according to the lifestyle choices they make and with regard to long-term sustainability of these choices. Variation and variety can take several forms—biological, cultural, social and economic. We need to understand the importance and value of each of these forms of diversity to the quality of human life. The natural environment comprises ecosystems which include the plants and animals of an ecological community and their physical surrounds, forming an interacting system of activities and functions regarded as a unit. The cultural environment comprises all the tangible and intangible evidence of human activity, including buildings, traditions and beliefs. Significant elements of the environment have cultural and historic values that may require protection from unplanned or unwise human activity. The balance of natural ecosystems and cultural heritage can be affected by unplanned or unwise human use of resources. Sometimes the resulting problems are so severe that changes in management practices and human lifestyles are necessary to protect the cultural environment or to allow ecosystems to, if possible, rebuild their ecological balance. Poor choices may affect the wellbeing and lifestyle of future generations. Attitudes of concern for the quality of the environment are required to motivate people to develop the skills necessary for finding out about the environment and to take the necessary actions for environmental problem-solving. The variability among living organisms from all sources, including terrestrial, marine and other aquatic ecosystems and the ecological complexes of which they are part. Biodiversity includes diversity within and between species and the diversity of ecosystems. Conservation is the careful use, protection and management of ecosystems, heritage and natural resources to ensure their long-term viability. It is different from ‘preservation’ which refers to maintaining a pristine state of nature as it is or might have been before the intervention of human activities. A measure of the consumption of renewable natural resources by a human population. A population’s EF is the total area of productive land or sea needed to produce all the crops, meat, seafood, wood and fibre it consumes, to meet its energy consumption and to give space for its infrastructure. The EF can be compared with the biologically productive capacity of the available land and sea to see if the population is sustainable in the long term. The measure can be applied to an individual, a family, a school, a community, a country or the whole world. Development that meets the needs of the people today without compromising the ability of future generations to meet their needs. To be sustainable, any use of resources needs to take account of the stock of resources and the impacts of its utilisation on the ecological, social and economic context of people today and in the future.